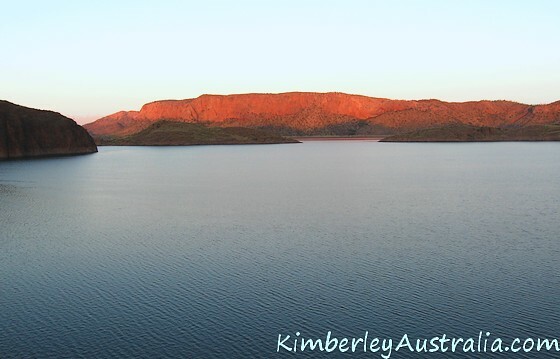 Lake Argyle in Western Australia will likely be your first stop in the Kimberley if you are travelling from Darwin/Katherine or your last stop coming from Broome. 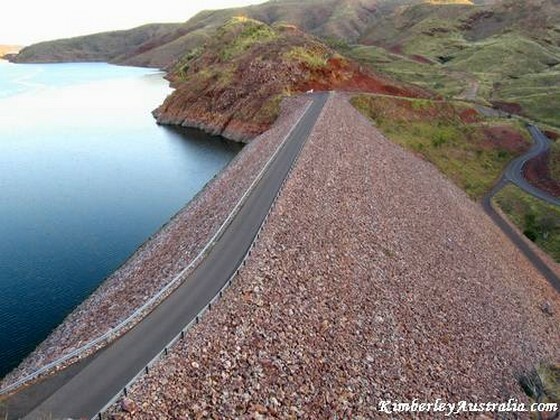 The huge man made lake is near the border between Western Australia/the Kimberley and the Northern Territory. It makes for a good stopover on the way to Kununurra. Above is a view over a very small part of the lake from one of the lookouts. 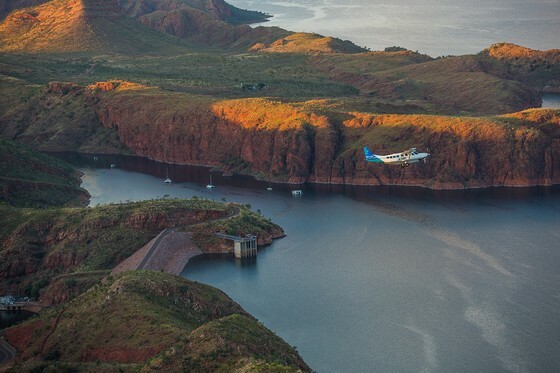 To appreciate the dimensions of Lake Argyle you need to take a scenic flight. Any photos taken while driving or walking will only show a tiny part of it. Even the cruises don't access all that much of it. 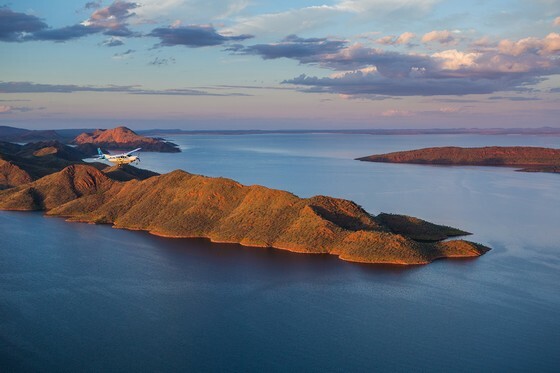 Lake Argyle covers an area 18 times the size of Sydney harbour, 1000 km2. At full flood level that area increases to 2100 km2! The main Ord Dam, which holds back these huge amounts of water, is surprisingly small. In the photo below you see the dam and above it a small bay with some boats anchored in it. 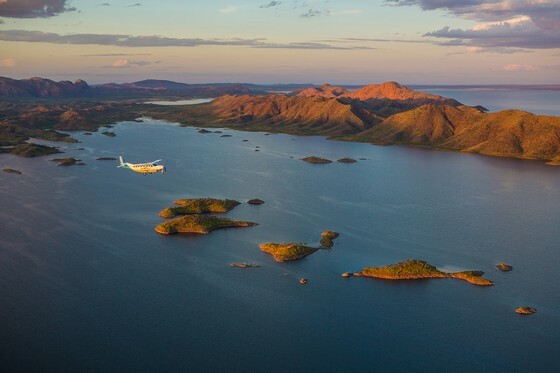 The Lake Argyle Resort is not in the picture, it is up on the hills to the left of the little bay. Above the land mass in the top half of the photo you see the waters of Pannikin Bay. Here is a map of (very) roughly the area you see in the picture. Zoom out and you may start to get an appreciation of just how large Lake Argyle really is. By the way, don't confuse the main Ord Dam holding back Lake Arglye with the Diversion Dam west of Kununurra. The Diversion Dam also dams the Ord River and holds back the much smaller Lake Kununurra. The main highway (Great Northern Highway) crosses the Diversion Dam. Unlike the concrete and steel structure of the Diversion Dam with its hydraulic gates, the main Ord Dam up at Lake Arglye is an earth filled dam with an impervious clay core. A road crosses the dam and then leads down and ends at a well maintained grassy picnic area at the bottom of it. The next photo was taken from the top of the dam. 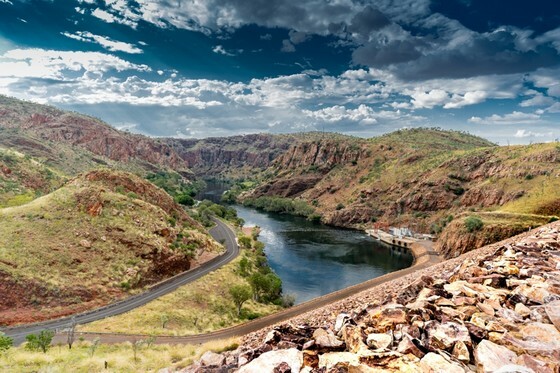 It shows the Ord River below the Ord Dam, disappearing into the direction of Carlton Gorge. You can't see the picnic area. It's under the trees on the left of the river. But what you can see really well here are the hills I mentioned in the beginning. they belong to the Carr Boyd Range. This is the kind of country you are driving through to get to the lake. Red, red hills, narrow valleys, and the occasional glimpse of the lake as you get closer. The photo below was taken from slightly higher up. It's from my readers Mike and Amanda and is much better than mine. The bottom of the dam was already in the shadows, but the hills on the other side are still lit up by the evening sun. One of the unusual features of the Ord Dam is the fact that its overflow, called the Spillway, is not situated at the dam itself but at the northern end of Pannikin Bay. 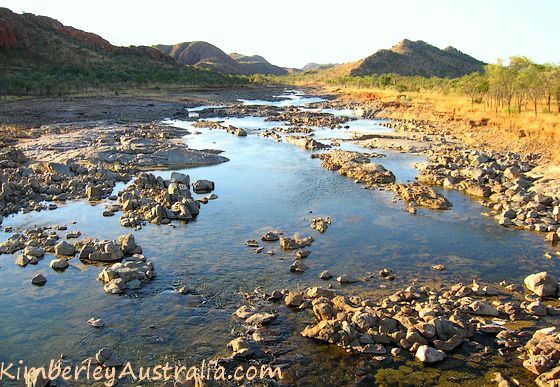 From there the water makes its way along Spillway Creek, through the Carr Boyd Range, back into the Ord River. The above photo was taken on the way to the lake, standing under the bridge that goes over the creek. It's the end of the dry season and there isn't much water left. The picture also gives you a glimpse of the hills that make this drive so interesting. This is a country of mostly flat and straight roads, which makes the drive to the lake all the more remarkable. The last of the sunset over the lake. 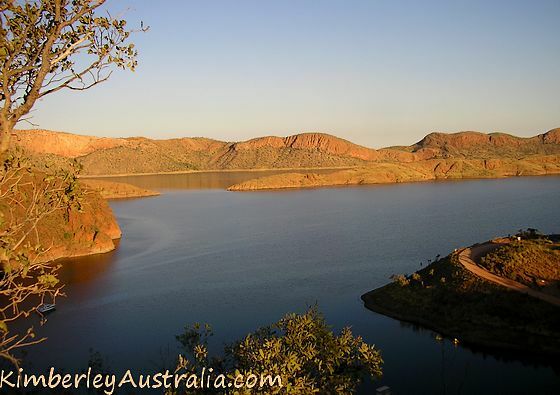 If this is your first visit to Lake Argyle and you only go for a day then I recommend you go very early, have a good look around, visit the museum (see below), catch one of the cruises, and enjoy the late afternoon sun in the hills of the Carr Boyd Range on the drive back. 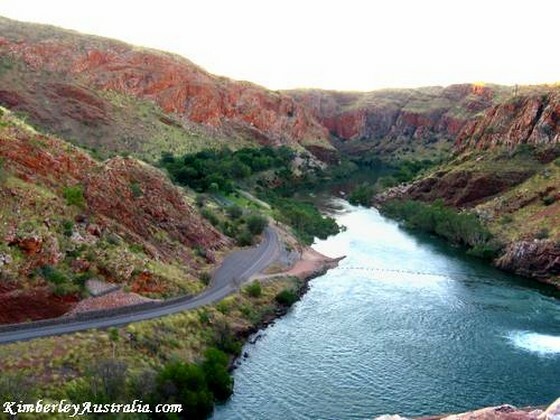 The turn off to Lake Argyle is 35 km east of Kununurra and 7 km west of the NT/WA border check point. From there it is another 35 km, an exceptionally scenic drive through the hills of the Carr Boyd Ranges. The signposted Spillway Lookout can be found on your left, a few kilometres after you cross the bridge over Spillway Creek, on your drive towards the lake. Pannikin Bay Lookout is also on your left, also shortly before you get to the Argyle village. It can also be reached on foot via a short walk from the Arglye Resort. Several more lookouts, all well signposted, are situated between the Argyle Resort and the main dam. Of course the dam itself offers great views, too. But the best views you have to earn, they can only be reached on foot via the Ord River Gorge Walk Trail and the longer St. Georges Terrace & The Bluff trail. To get to the picnic area just continue following the the road across the dam to the end. Argyle Cruises offer morning, sunset and full afternoon cruises on the lake. 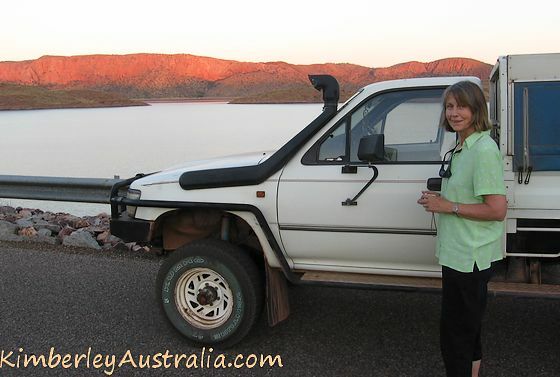 Triple J Tours do cruises on the Ord River from the lake to Kununurra or back. 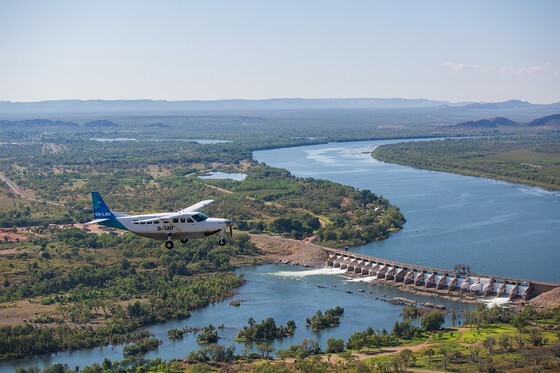 Check Helispirit for scenic helicopter flights, Aviair for fixed wing flights from Kununurra. The popular Infinity Pool is free to use for guests, day visitors are welcome and pay a fee. In 1971 the famed original homestead of early Kimberley pioneer Patsy Durack was dismantled and moved from its original site to prevent it from being flooded by the dam. It has been reconstructed as a museum about those early pioneering days. You can reach it on foot from Argyle Resort via a scenic walking trail or drive the 2 km. 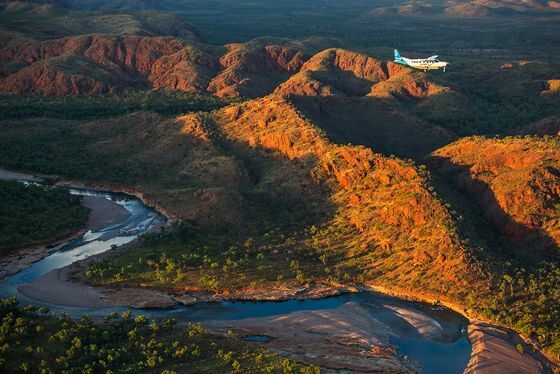 Read more about the Kununurra region.